Male International Airport or Velana International Airport is the main International Airport in the Maldives. It is one of the busiest international airports in the region. 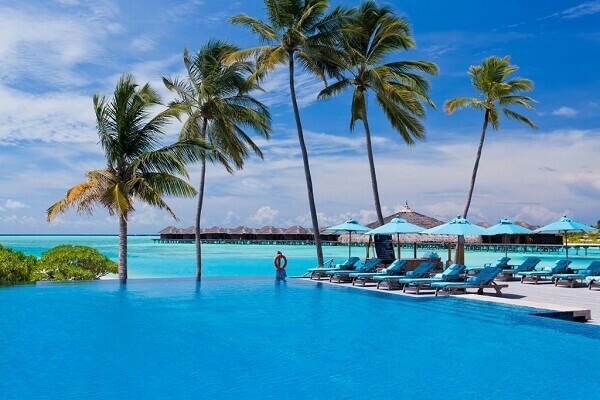 The Maldives receives a large number of foreign tourists each year especially for their beautiful island resorts. However, a lot of people want to spend money on staying at the island resort. They want to save money on transfer from Male Airport to the resort. 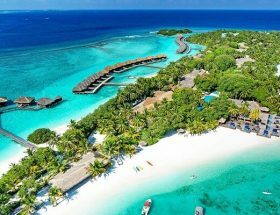 In this article, we have compiled a list of 10 closest island resorts from the Male International Airport aka Velana International Airport. To know distance between Male International Airport and all other resorts, refer this article. Vakarufalhi Island Resort is one of the closest island resorts from the Male Airport or Velana International Airport. The distance between Male International Airport and Vakarufalhi Island Resort is just 4.9 km. It’s a good place for new year celebrations. The resort is located in South Ari Atoll and can be reached by speedboat easily and quickly. It is one of the most suitable and good resorts to stay near the Maldives International Airport located in Male. The resort features beautiful coconut trees, white sandy beaches, and amazing crystal clear waters. The resort is a beautiful place for every occasion and holiday, i.e. birthday party, wedding anniversary celebrations, new year, Christmas, and everything else. Check latest rates from here. Taj Exotica Resort & Spa, Maldives is one of the closest island resorts to Male International Airport (Velana International Airport). 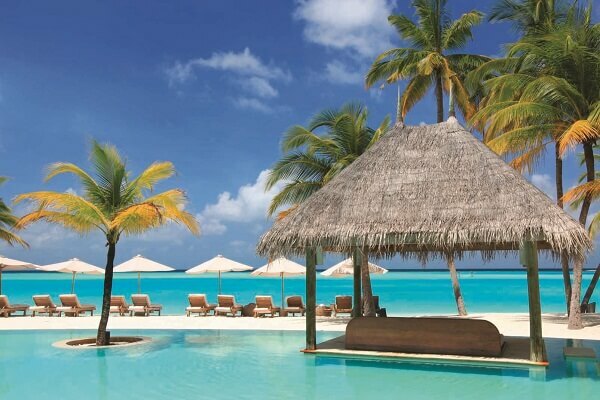 The distance between Male International Airport and Taj Exotica Resort & Spa Maldives is just 9 km. Take a speedboat ride from Male International Airport to the resort. This ride offers you an amazing and wonderful experience and may take up to 15-minutes. 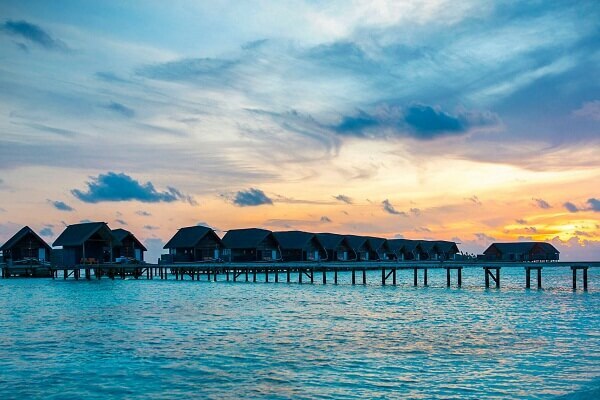 There are 55 water villas, categorised in several classes, from large to enormous. During low season, the charges per night ranging from US$843. On the other hand, the high seasons charges per night ranging from US$1031. To check latest rates and great deals, visit this page. Adaaran Prestige Vadoo is one of the most popular island resorts in the Maldives, located near Velana International Airport. The distance between Male International Airport and Adaaran Prestige Vadoo is just 10.7 km. A special speedboat service is available to the resort guests at the International Airport. It’s an exclusive service to the resort guests only. You just need to take a speedboat from Malé International Airport for Adaaran Prestige Vadoo. It may take up to 15-minutes to reach your beautiful resort. It is one of the cheapest ways to spend your holiday in the Maldives. It saves your money for your next holiday trip. Paradise Island Resort & Spa is one of the most beautiful island resorts in the Maldives closest to the Male International Airport (Velana International Airport). The resort has about 62 water villas / overwater bungalows and 282 rooms / suites in total. The distance between the Paradise Island Resort & Spa Maldives and Male International Airport is just 11 km. By speedboat (from Male International Airport), you can easily reach to the resort in about 20-minutes. You can check latest and lowest rates here. 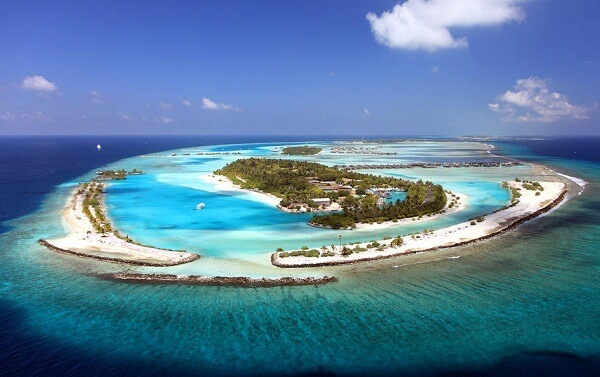 Gili Lankanfushi Maldives is a perfect island resort for romantic holiday in the Maldives. 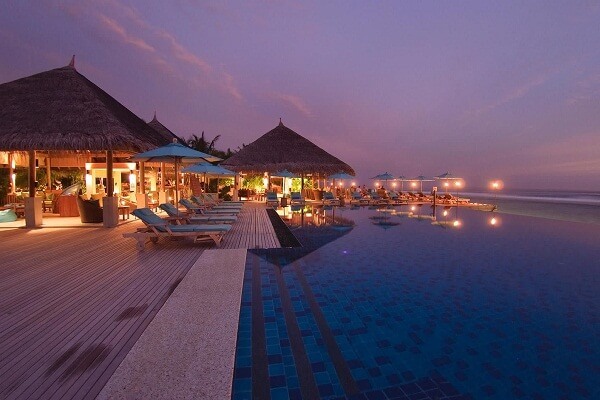 It is one of the most popular honeymoon resorts in the Maldives, popular among the young couples. In 2018, TripAdvisor ranked it as among the Top 5 Best Hotel in the World 2018. 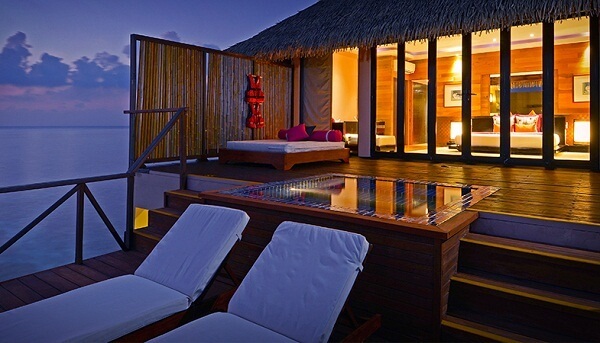 The resort features natural materials, and wood floors and beautiful overwater villas. The overwater island resort offers many modern facilities, such as free Wi-Fi, a spa, a cinema, chic pool, hot tub, room service, local seafood, private motor boats, and much more. To reach Gili Lankanfushi Maldives Resort from the Male Airport, you can take a speedboat ride, which may take up to 20 minutes ride. The distance between Male Airport and Gili Lankfanfushi Maldives Resort is just 12.2 km. 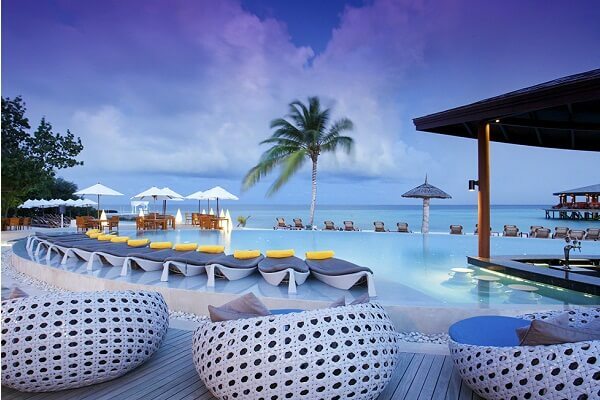 Centara Ras Fushi Resort & Spa Maldives is one of the most visited island resorts in the Maldives. The distance between Male Airport and Centara Ras Fushi Resort & Spa Maldives is just 13 km. The distance can be covered by a speedboat ride, which may take up to 15 minutes to reach the resort. 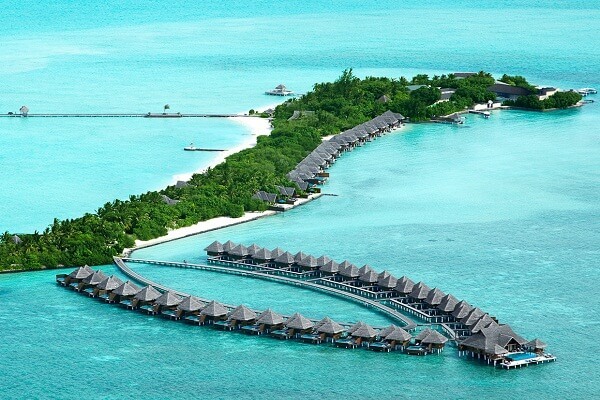 The resort has 64 water villas / overwater bungalows and total 140 rooms / suites. The resort offers Wi-Fi, room service, wooden steps, an entertainment centre, ceiling fans, a mini bar, tea making area, and much more. 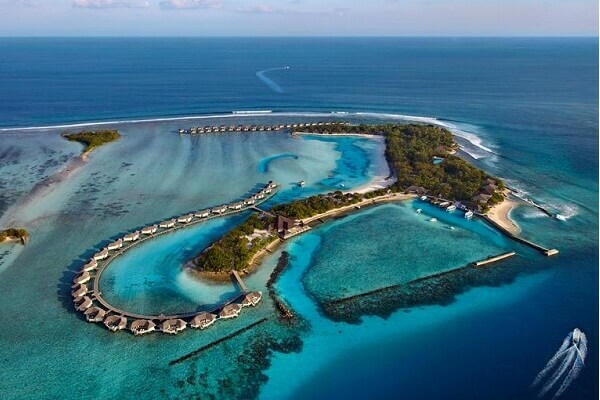 A prior reservation is required to get confirmed overwater villa in peak season. Thulhagiri Island Resort is a beautiful island resort, located in North Male Atoll, approx. 13 km from the Male International Airport (Velana International Airport). To reach the resort island from the Male Airport, take a speedboat ride, which may take up to 25 minutes. The island resort offers beautiful beach view, amazing crystal clear waters, beautiful ocean view, amazing modern facilities, reasonable rates compared to other luxury resorts, and much more. Many popular tourist attractions are also located near the island resort. Cinnamon Dhonveli Maldives is one of the closest island resorts to the Male International Airport aka Velana International Airport. The distance between Cinnamon Dhonveli Maldives and Velana International Airport (Maldives International Airport) is just 16 km. This distance can be covered by a speedboat which may take up to 20 minutes of boat ride. 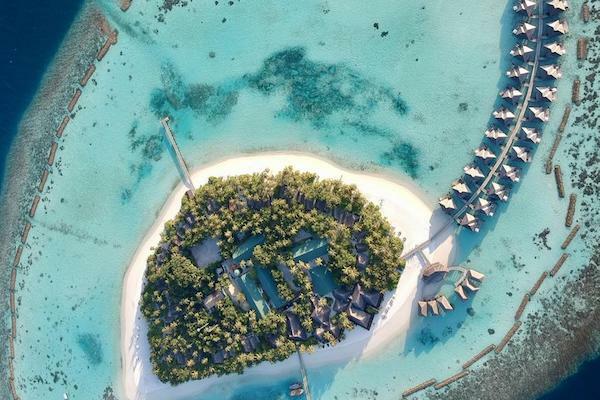 The island resort has 60 water villas / overwater bungalows and has total 115 rooms / suites. A very rare thing in the Maldives, they offers a surfing beach on the island. 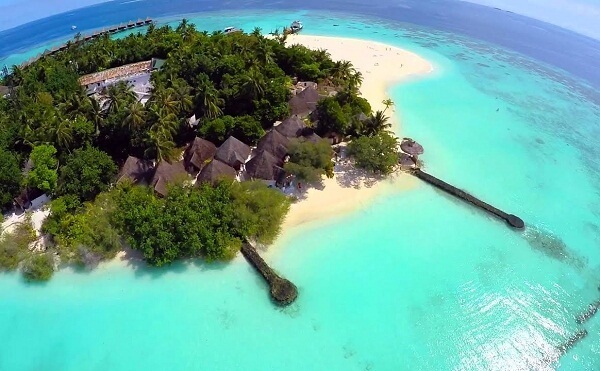 It is one of the cheapest overwater island resorts in the Maldives. 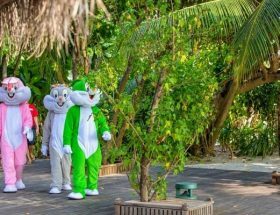 COMO Cocoa Island Resort is one of the closest island resorts to the Male International Airport aka Velana International Airport. The distance between the COMO Cocoa Island Resort and Velana International Airport can be covered by taking a speedboat ride, which may take up to 35 minutes of journey. The resort has 33 water villas / overwater bungalows and 36 total rooms / suites. The island resort offers a bar, various water sports activities including diving, snorkelling, and much more. It’s a perfect location for romantic holiday for young couples and newly married couples. 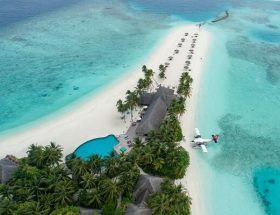 Anantara Veli Maldives Resort is one of the best luxurious island resorts in the Maldives, closest to the Male Airport. The island is located in South Male Atoll, Maldives. It’s a beautiful and wonderful location for each occasion, such as wedding anniversary, birthday celebrations, honeymoon, and much more. The distance between Anantara Veli Maldives Resort and Male International Airport is just 20.8 km. This can be covered by taking a speedboat ride, offered by the island resort itself. An advance arrival information should be provided to the island resort for necessary speedboat arrangement. Article first published on December 15, 2018.